Though it may not quite feel like spring, warmer weather is just around the corner, and in the Pittsburgh area, that means we are all spending much more time outside than we did all winter. It also means you need to be sure that your yard and outdoor entertaining areas are inviting, safe, and secure for family, friends, and pets. If you are considering a new or replacement fence on your property, now is the time to begin the process. 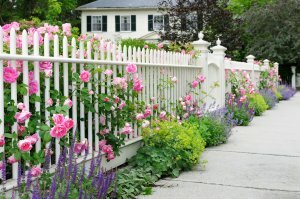 Spring and summer are the busiest time for Fence by Maintenance Service, and waiting any longer to start planning a fence installation may mean that you miss out on enjoying your yard for part of Pittsburgh’s glorious spring and summer seasons. PVC Fencing-available in multiple colors and styles, impact and UV ray resistant, great for yards, pool enclosures, and property line designation. Deciding on a fence style is just one of many steps in the fence installation process, so don’t delay! Call one of Fence by Maintenance Service’s Pittsburgh offices today to get the ball rolling on your new fence! As Pittsburgh’s local, family-owned fence installation company, our goal is to serve Pittsburgh area residents and businesses with excellence. Our professional, seasoned team will work to ensure that you get exactly what you want and need in a fence. We look forward to serving you!